This collection is from a month-long campaign to create more GOOD in the world. I hope some of these…even just one from the list, gives you a new idea, a new spark, and a path to creating more positive attitude for yourself. As one of the points below highlights, “positive begets more positive; it’s infectious”, or something like that. So give it a try. Get after it. And stay after it. Straight from Tim Ferriss. Absolutely true. “Make your bed every day.” Try it for a week. Feel the POSITIVE follow. Cultivate and maintain a good sense of humor. Find the funny in the everyday. I.E., “I’ve decided to stop wearing underwear.” Humor brightens your mood, and those around you too!-x. When something good comes to mind, share it. The share perpetuates the positive within yourself, and it’s infectious. Smile and laugh OFTEN. Maintain a sense of humor. Be cheerful. Remind yourself to savor: a good moment during the day, a pretty sky, your kid’s laughter, your dog (or cat) being SO happy you’re home! Don’t dwell on the negative. Instead, find and celebrate the positives, no matter how minor or small they might seem. The more you celebrate and are thankful, the more good karma that tends to follow. “Avoid loud and aggressive persons; they are vexatious to the spirit.”. “It is so, it cannot be otherwise.’ ~ Inscription in Flemish in 15th century cathedral in Amsterdam. The meaning? Accept things as they are. THEN consider and take steps to improve them if need be, and if possible. Begin the day with 15 minutes of personal reflection, affirmations, reminding yourself to BE POSITIVE. Reward yourself frequently with little snippets of GOOD, whatever makes you happy: a brief break at work or home doing chores, a bit of spontaneous entertainment (read, TV, internet wandering, a cookie,…). Lean in. Don’t avoid difficulty and struggle. Instead, shift your mindset. Life is difficult. Accept it. Transcend it. On the other side? A more positive attitude. Music, lots of music. All kinds. Any kind. Let it left you. That’s EXACTLY what it’s for. Hold On. It’ll get better soon. Periodically, harken back to a another, maybe simpler time when you were happy. Let your hair down and have a slice of cold pizza for breakfast. Or have breakfast for dinner. Allow simple things to make you happy. Like birds eating from the feeder you put up. If something isn’t to your liking, don’t whine or wring your hands. Instead, change it, if you are able. If not, accept it and move on. Celebrate within the small victories as big wins..
Keep a to-do list, and USE IT, daily. Checking things off the list makes us feel more positive about progress and control. Journal. Everyday. Write something. Anything. But write it down. You’ll be surprised at the thoughts, and the insights. Ask for help. Accept help. And help others. We’re in this is together. Periodically center your attitude, and if you feel it’s slipping away from positive, purposefully RESET to GOOD. Consider the alternative. Studies show those who worry die young. So it’s not just fluff and fuzzy feel-good stuff, this positive thinking, it’s a matter of life and death. Choose Positive. Choose Life. Believe that Positive is greater than Negative. Live that life. Share that life. POSITIVE Wins in the end! Here are some resources to dig further into the GOOD. I was thinking about being sneaky yesterday, and for some reason, the old Mad Magazine comic strip came to mind, “Spy Versus Spy“. 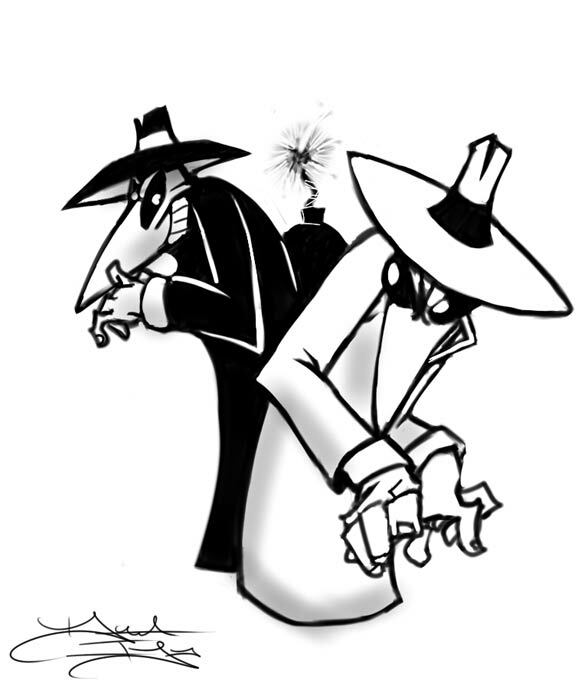 I thought about the White Spy and the Black Spy sneaking around, in an endless battle to do the other in. That gave me a chuckle. But as I thought about the nature of sneakiness, my smile faded. In the final evaluation, while it’s fun to play by “sneaking around” — think “Hide & Seek”, or “Capture the Flag” — and while being sneaky is necessary in the context of planning a surprise party (birthday, retirement, anniversary, etc. ), it’s decidedly not a good practice otherwise. Being sneaky with family and friends is dishonest. It’s being dishonest with them, and it’s being dishonest with yourself (unless deceit is your MO). What are some examples of the sneakiness of which I speak? Eating cookies on the sly from the cookie jar or the pantry when you know you’re not suppose to. That’s being sneaky. Watching videos on your smart phone or tablet under the covers when you’re supposed to be going to sleep. That’s being sneaky. Cheating on homework. That’s being sneaky. Your kids hiding their gaming from you. That’s being sneaky. So is “sneaking” out of the house. Habitually buying things on-line and hiding them from your spouse. That’s sneaky. Hiding secret messages is being sneaky too. In fact, the word “secret” is a good corollary word to consider when talking about being sneaky. Being sneaky is a parallel skill to keeping secrets. My wife wisely started teaching our kids at their still very young age that having secrets isn’t a good idea, overall. Being secret means keeping information away from other people. Within a family, that’s not only a bad idea, it’s potentially hurtful and damaging and mean. With family and friends, the very purpose of those relationships is to nurture and strengthen and support each other. Transparency and honesty are critically important. Sharing experiences and feelings and thoughts strengthens the bonds with family and friends. Secrets are damaging to relationships. Pile up enough secrets, and the bond is weakened. Ultimately a relationship will be destroyed by secrets, crushed under the weight of dishonesty. So unless you’re planning a surprise party or playing Hide & Seek with your kids, don’t be sneaky. Once again, another edition of Friday Faves is here. GOOD tucked away…just waiting to be found! ENJOY. Destination of the Week: China’s “Silicon Valley”…not far from Beijing….lots going on here! Langfang, China. Website of the Week: Brain Pickings. Can’t say enough good things about this site and the source. Maria Popova has an amazing array of interests, deep, thoughtful perspective. If you like to think, ponder, consider, reflect, THIS is for you. Sharing in part the instruction of Sir William Osler early in his book, Carnegie describes how Osler, using the metaphor of a trip on an ocean liner, told his medical students at Yale to “learn to control the machinery as to live with ‘day-tight compartments’ as the most certain way to ensure safety on the voyage. Get on the bridge [of the ship], and see that at least the great bulkheads are in working order. Touch a button and hear, at every level of your life, the iron doors shutting out the Past-the dead yesterdays. Touch another and shut off, with a metal curtain, the Future -the unborn tomorrows. Then you are safe-safe for today! Shut off the past! Let the dead past bury its dead. … Shut out the yesterdays which have lighted fools the way to dusty death. The load of tomorrow, added to that of yesterday, carried today, makes the strongest falter. Shut off the future as tightly as the past. … The future is today. … There is no tomorrow. The day of man’s salvation is now. Waste of energy, mental distress, nervous worries dog the steps of a man who is anxious about the future. The rest of Carnegie’s book helped me a lot in my early, post-college years, as I worked to establish myself as an adult. For sure though, the basic strategy to “compartmentalize” is likely the most profound concept for me, and has been a significant factor in living a happy and productive life. It’s helped me put worry in it’s place, well behind me, neutralized. Recently I was reflecting on this strategy and drilled down further in its application. The ability to compartmentalize helps me in (at least) three categories of my thinking. Being present and focused allows us to cope with the many demands we have in our daily lives: pressures at work, deadlines at school, stresses at home. The key is to close the door on the day once it’s concluded, actively release any negative energies, follow whatever process(es) you use to relax, and do so. Reset your mind, reset your soul. Another facet of compartmentalization is as an approach to combat the possible linkage of life issues, especially in the negative sense. What I mean here is, often if something “bad” happens to us, some negative issue comes up, we may have a tendency to allow that one negative instance effect other things in our life. This linkage is not helpful to your attitude, nor is it good for your health. Don’t allow one (or two, or three) negative circumstances dictate your outlook overall. When faced with a challenge, a bad outcome, etc., deal with the situation as best you can, debrief with others (and/or yourself) as soon as possible, and then put issue behind you. Give yourself a few minutes to gather yourself — a few deep breaths, a brief walk, whatever you need to reset yourself, and then move forward with your day. The final area that the skill and strategy of compartmentalization can be extremely helpful is in relationships. This fact is true whether you’re considering your work colleagues, new people you meet or interact with everyday, or those most intimate relationships with friends and family. In other words, if you have a negative interaction with someone, whether it’s in the office, at school, or on the highway, be it with your wife, or your son, or a customer, or your boss, or the mailman, if a bad exchange occurs, don’t let it effect how you treat everyone else. Gather yourself, reset your attitude/mood, and move on. Altogether, following Dale Carnegie’s suggestion taken from Sir Osler’s characterization is sound advice. And in fact, that advice didn’t originate from Sir Osler, but in fact was even passed down to Osler who’d first heard the advice nearly 150 years ago. It was Thomas Carlyle that helped Osler lead a life free from worry when Osler ready these twenty-one words: “Our main business is not to see what lies dimly at a distance, but to do what lies clearly at hand.” And if you’re able to compartmentalize the negative things that we come across throughout life, we’ll be able to do just that. Learn more about Sir William Osler here. Deep breaths to calm, reset, control yourself? Oh YES. Wim Hof (“The Iceman”) uses breathing as the foundation for his unique method. Read more here. And VOILA!, another edition of Friday Faves is here. Snippets of GOOD I found anew, or remembered from before, and offer up here to share. Destination of the Week: An ancient trading country (human remains have been found here dating back eight thousand years), and one of the more stable in the region, Oman is the pick this week. Also came to mind thanks to some renewed business interest in the country. Quote of the Week: “The author is not responsible for vulgar or other inappropriate content that appears in this message due to this stupid phone’s auto-correct function.” -the email tagline from a work colleague who travels a lot, thus conducting a lot of business via his mobile phone. Meal of the Week: Not a meal this time, but a beverage. A high-octane selection from none other than Tim Ferriss. It’s a “clean drink”, the Nor Cal Margarita (two shots of high-grade tequila, club soda, and as much lime (or lemon) juice as you can handle. Website of the Week: I use this site pretty much every week to get the low-down on any country that comes up during the day’s work. And imagine that, it’s from the US Government! Check it out. There you have it. Have a good weekend!